Although dwarf hamsters are smaller than their Syrian cousins, they have faster metabolisms and therefore similar calorie needs. The bulk of their diet should come from a quality commercial hamster food made up primarily of seeds, grains and pellets. About a tablespoon per day suffices. Beyond that, you should provide a small amount of fresh supplemental food every other day or so, a small portion of which can be certain fruits. Before supplementing your dwarf hamster's diet with fruits or vegetables and other foods, understand that she'll eat just about any food item she encounters. She doesn't have a great sense of what's healthy, unhealthy or potentially dangerous. It's up to you to verify that anything you feed her is safe. Once you've determined certain fruits are OK, introduce them in tiny quantities to make sure each one agrees with your individual pet and doesn't make her sick or cause diarrhea. Also, start by providing fruit only once a week for a few weeks, then gradually add in a piece here and there until you're providing a little fruit every two or three days. This helps your dwarf hamster's digestive system become accustomed to the increased fiber and sugar, hopefully preventing diarrhea and other digestive upset. Lots of common fruits are safe for your dwarf hamster to eat, and chances are she'll enjoy most or all of them. While this isn't an exhaustive list, some acceptable fruits include apple, banana, blackberries, blueberries, cantaloupe, cherries, cranberries, figs, grapes, honeydew, kiwi, kumquat, loganberries, lychee, mango, papaya, peach, pear, plum, raspberries, starfruit, strawberries and watermelon. Note that hard seeds, pits and stones are not safe for your hamster, though, so they must be removed before feeding when applicable. There aren't many fruits you can't feed your dwarf hamster, but a few are off-limits. Generally, fruit won't cause toxicity. However, certain fruits easily cause hamsters digestive problems or can get stuck in their cheek pouches or on their teeth. In latter cases, your hamster can develop tooth decay or injuries and abscesses in her cheek pouches. Fruits to avoid feeding your dwarf hamster include avocado, pineapple, tomato and any citrus fruits, including but not limited to lemon, lime, orange, clementine and grapefruit. Dried fruits, including raisins, are usually too sticky to be ideal for dwarf hamsters. Also, remember that hard seeds and pits are no good for your dwarf hamster. Remove all hard seeds and stones from apples, cherries, peaches, plums, grapes, melons and other fruits that contain them. 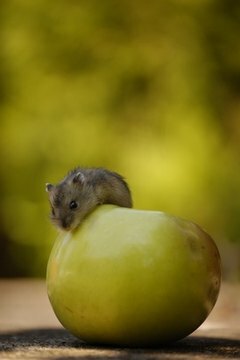 The high water content of certain fruits readily gives dwarf hamsters diarrhea. Watermelon is particularly problematic in this respect. Fruits with high water content should be kept to a minimum, both in quantity and in frequency of feeding. All that water can also fill your hamster up easily and prevent her from eating her feed, which is where she gets most of the nutrients she needs. Offer fruit after you know she's eaten a proper meal. Dwarf hamsters are also highly susceptible to diabetes, making fruits with especially high sugar content poor choices for offering often. Keep figs, grapes, mango, bananas, cherries and apples to a minimum. Also, remember that your hamster likes to stash food away for a later time. Fresh fruit can quickly start to rot, so make sure you poke around in the bedding to remove any uneaten fruit that got buried.